Former Cheltenham Gold Cup winner Imperial Commander is out this year's race on 15 March with a lung infection. The 12-year-old, who beat Denman and Kauto Star when winning the big race in 2010, may run at Aintree's Grand National meeting in April. 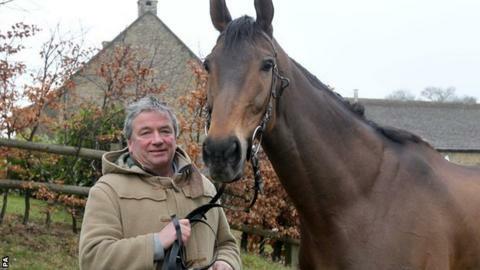 Trainer Nigel Twiston-Davies told BBC Sport he would like to run the horse in the National if he recovers, although a decision rests with his owners. "He's had little setbacks and hasn't realised his full potential," he said. Two of the stable's other intended Festival runners, Astracad and The Cockney Mackem, are also out because of a bug in the yard but Neptune hurdle second favourite The New One is unaffected. Imperial Commander returned from 680 days off to finish a close second to Cape Tribulation at Cheltenham in January and had been about a 16-1 chance to become only the second horse, other than Kauto Star, to regain the title. "It was a great performance on his return. We were very much hoping he was still in that sort of form, but we haven't got time to get him ready for Cheltenham next week," said Twiston-Davies. "He's still got time to be ready for Liverpool. I would very much like to go for the National, but he's not my horse. Let's just get him really well and see from there." The horse has been a brilliant performer for the Gloucestershire-based trainer but struggled with injuries since his Gold Cup victory. He triumphed by seven lengths in the 2010 running, which had been billed as a showdown between dual champion Kauto Star and his stablemate Denman, the 2008 winner for Somerset trainer Paul Nicholls. Ridden by Paddy Brennan, who raised his finger to his lips as he passed the winning line after silencing supporters of the two favourites, 7-1 shot Imperial Commander was clear of Denman with 2009 Grand National winner Mon Mome third after Kauto Star fell. Bobs Worth, trained by Nicky Henderson, is favourite for the 2013 Gold Cup, with stablemate Long Run - the 2011 winner - among other leading contenders, alongside Sir Des Champs and Silviniaco Conti.